Welcome eagle enthusiasts! 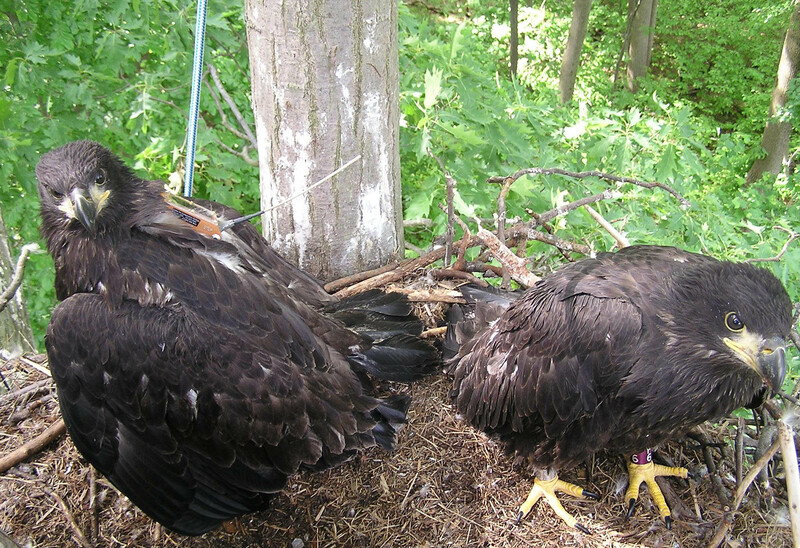 If you’ve spotted a Bald Eagle banded with a colored leg band, this is the website for you! Note these band colors only apply to eagles seen in the Eastern part of North America (east of the Appalachian Mountains). You can check the table of color bands below to find the contact information for the corresponding eagle bander (some states have more than one bander so please contact both). 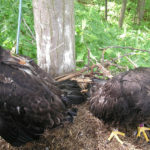 This list is only for eagles banded east of the Appalachian Mountains and in Eastern Canada. These eagle banders rely on YOU, the bird-watching public, to spot and report sightings of banded eagles. These sightings are used in eagle research to track eagle movements, monitor survival rates, and causes of mortality. In your email to the bander(s), provide your contact information, exact location of the eagle, band color, band code, and if possible, include a photo of the eagle. If a code was visible on the band, please report the code and color of the band to the USGS Bird Banding Lab at reportband.gov. Note: purple bands seen in mid-western states should contact: Michele McNulty (USFWS-KY), (785) 539-3474 X106.